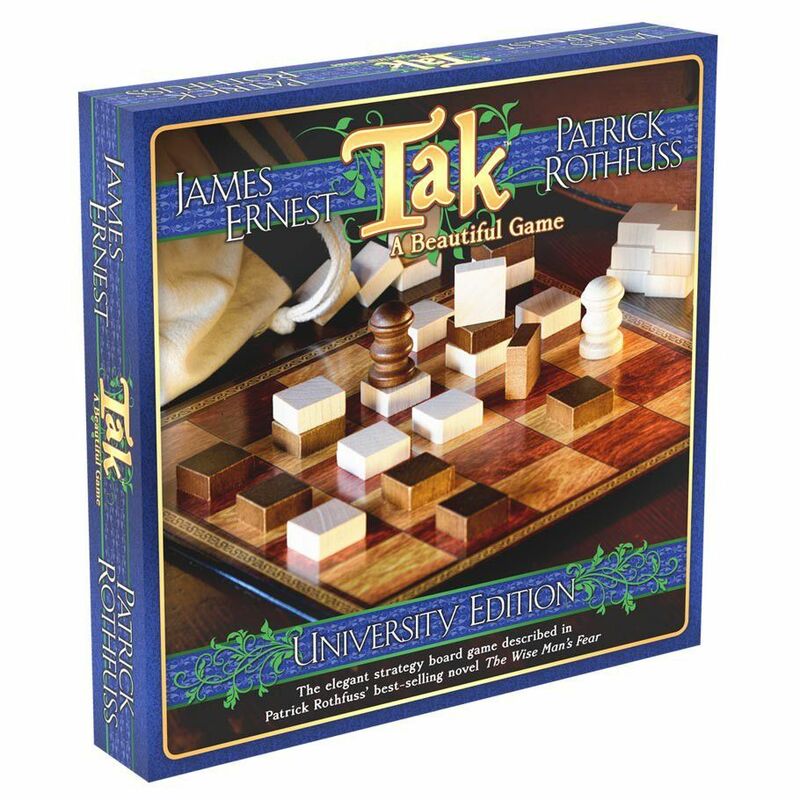 Tak: University Edition is a game by James Ernest and Patrick Rothfuss, published by Cheapass Games. It is for 2 players. In this game, based on the abstract strategy game from Patrick Rothfuss’ novel “The Wise Man’s Fear”, players will try to build a road across the board by stringing together pieces connecting one side to the other. The first player to create this road of pieces will be declared the winner. To begin, the board is placed on the table between the two players. The pieces are divided between the players, with one player receiving all the darker pieces and the other player taking all the lighter ones. The first player is chosen and play now begins. The game is played in a series of turns, much like in chess. Each player will take their turn until the end game condition is met. In the first turn of the game, each player will place one of their opponent’s stones onto the board in the flat position. Once this is done, players will be placing their own stones going forward. On a player’s turn they may either place a piece on an empty space move one of the stacks under their control. To place a piece, the player will simply place one of their pieces onto the board onto an empty space. If a player places their last piece or if they fill the last space on the board, the game immediately ends. It should be noted that a player has 2 different types of pieces that may be placed; stones and capstones. Stones may either be placed flat or standing on their edge. Flat stones can be stacked and count as part of a player’s road. Standing stones do not count as part of a player’s road and they can’t have anything stacked on top of them. This last type of stone is good for blocking and is thusly referred to as a “wall”. Capstones, like flat stones, count as part of the player’s road and they may not have any other pieces stacked on them. These pieces also have a special ability that lets them move onto a standing stone and flatten it, turning it back to a flat stone. The other action that a player may take is to move a stack under their control. To do this, the player chooses a stack that has one of their pieces on top of it. Stacks can be from one piece to many. The player will then take from 1 to 5 pieces off the top of the stack. This is known as the “carry limit”. The player then moves these pieces in a straight line, dropping at least one piece off the bottom of the stack in each space that the stack moves onto. It should be noted that capstones and standing stones will block movement since they can not have any pieces placed on top of them. Standing stones and capstones move in the same way as flat stones do. However capstones have the ability to flatten a standing stone as long as the final step of flattening the wall is done by the capstone alone. It should also be noted that a player may flatten their own standing stones with a capstone as well as their opponent’s. The game continues until one of the end game conditions are met. If a player connects opposite sides of the board with their pieces, that player is the winner. If either player runs out of pieces or if the board is full, the game ends. In these cases, the player with the most flat stones on top of stacks is the winner. Much like the Classic edition of Tak, this version comes with some really beautiful pieces. There’s a really nice looking 5×5 board that looks like a wooden checkerboard. It’s very sturdy and looks very nice. The game also comes with lots of wooden pieces in 2 different colors. The wooden pieces remind me of games like Quaridor and Quarto. For this game, there are an equal number of both light and dark pieces. This version of the game comes with 21 stones and 1 capstone in each color. That makes it possible to play a 3×3, 4×4 or a 5×5 game. The Classic edition will play 6×6 and 8×8 games as it has quite a lot more pieces. For this version of the game, all the flat stones are square pieces. In the Classic edition the darker pieces were more rounded, like a half moon while the lighter pieces looked like a trapezoid. They all have a nice wood finish on them and are very light weight but sturdy. The capstones look like something you’d find in a cabinet shop. This game also comes with a cloth drawstring bag to hold all of the pieces in, making it portable and easy to take with you. One good thing about the bag is that you don’t have to carry the board with you. You can simply throw the bag with all the pieces in it into a backpack or use the drawstrings to tie it to your belt. Then you simply pull out the bag and open it up to play anywhere. As for the board, you don’t really have to have it with you. You can draw a board on a sheet of paper, use a piece of chalk to draw a board or even play without a board. For this last way, you’d just need something to mark the center space with, like a penny or a scrap of paper. From there, once the pieces start being laid out, then you can really start to see the board. Overall, I really like the look and feel of this smaller and more portable version. It looks very nice. The rulebook for this game is very simple to read. It’s not very large, so it doesn’t take a long time to read through. There’s nothing difficult to understand either. The book has lots of great looking pictures and examples, including a few comic book style illustrations. Every aspect of the game is explained in great detail. There are several different ways to play, as mentioned above, and the rulebook gives the piece counts for each size board. The book even includes some basic strategy tips for playing the game, as well as rules for multi-game scoring. The book also includes some University Gambling rules as well. These include antes, bidding, calling Tak and the end rewards. This adds another layer of fun to the game for those looking to add a bit of profit to their pockets. Overall I find the rules to be very comprehensive and nice to look at too. I think the book is well designed, just like the game. To be honest, I don’t exactly know the history of the game of Tak, apart from that it is mentioned in Patrick Rothfuss’ novels. I also have never read one of his books. Which I guess I probably should, as they appear to be quite interesting looking. This game is an abstract strategy game full of really nice looking wooden pieces, much like Quaridor or Quarto. It’s one that will really make you think, much like Chess or Checkers. It’s a fairly simple game to play but is one that will take awhile to master, much like Chess. The object of the game is to make a path from one side of the board to the other, simple enough. If you’re not able to do that, then you’ll want to have control of the most stacks on the board. Either way, it’s a real thinking man’s (or woman’s) game. Having played the Classic edition several times, I have to say that I kind of like this smaller and more portable version a little better. For one, it’s quite a bit faster. The larger games can take up to an hour or so, while this version can be played in about 30 minutes or so. I also like the portability of this version and the ability to play anywhere. While I like that there are added rules for multi-game scoring and gambling, I tend to stay away from these aspects as I prefer the regular rules of play. Players that like a good game of strategy should really enjoy this one. I like the overall look and feel of the game, as well as the strategy and fun of it too. Fans of abstract strategy games like Chess and Checkers or even Quaridor and Quarto, should enjoy this one. I really like it and would highly recommend this version. 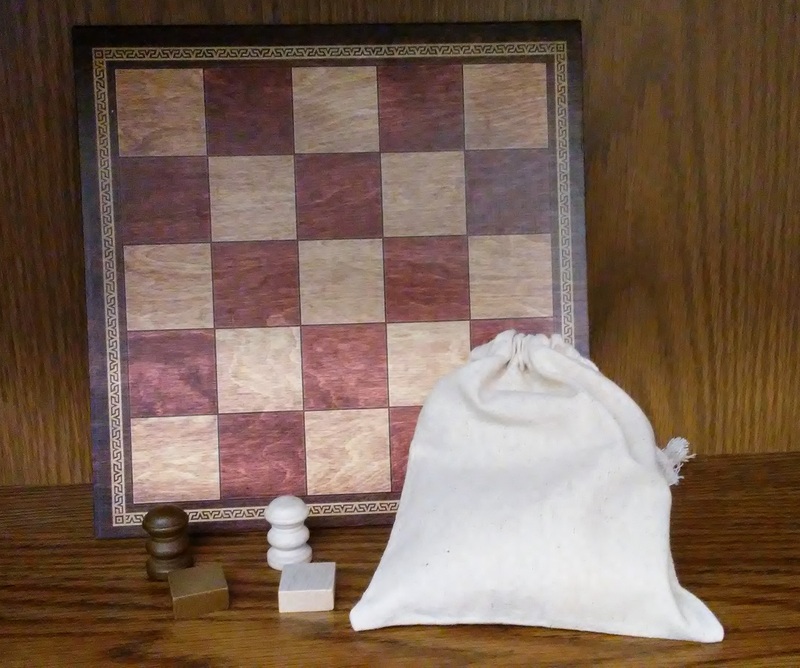 Tak: University Edition is a highly portable and smaller version of the Classic abstract strategy game Tak. The game is played fairly quickly, with most game sessions lasting around 30 minutes or so. The wooden pieces are very high quality, as is the board. The cloth bag makes it easy to carry the pieces to be played virtually anywhere. The rules are very easy to read and understand and are very well designed. The game itself reminds me of classic strategy games like Checkers and Chess, as well as new classics like Quaridor and Quarto. It’s a very fun 2 player game that looks beautiful too. This version is easily carried with you and plays a bit quicker than some of the larger boards of the classic game. Fans of strategy games should really enjoy this one, especially if they’re looking for an easy game to take with them. While it is a bit smaller, the fun has not been diminished. I really like this version and would highly recommend it. As someone who used to do a lot of backpacking back in the days, this would have been great to carry with me on the trail. I really enjoy this one and think most players will too. Forget Beer Pong, play Tak instead. This entry was posted in Reviews and tagged board, board games, card, card games, cheapass, cheapass games, edition, ernest, games, james, james ernest, patrick, patrick rothfuss, rothfuss, tak, university, university edition. Bookmark the permalink.